The spectrum of wine personalities in the United States encompasses some of the most passionate and deeply knowledgeable individuals to be found in any profession. From compelling wine writers to high-profile sommeliers, from visionary importers to devoted wine cellar advisors, from tireless brand ambassadors to wholesale agents, to those who provide the tools and messaging for their success, the wine industry is home to many accomplished actors! SlaveToTheGrape: At what point did it become clear to you that your fate would be inextricably linked to the world of wine? 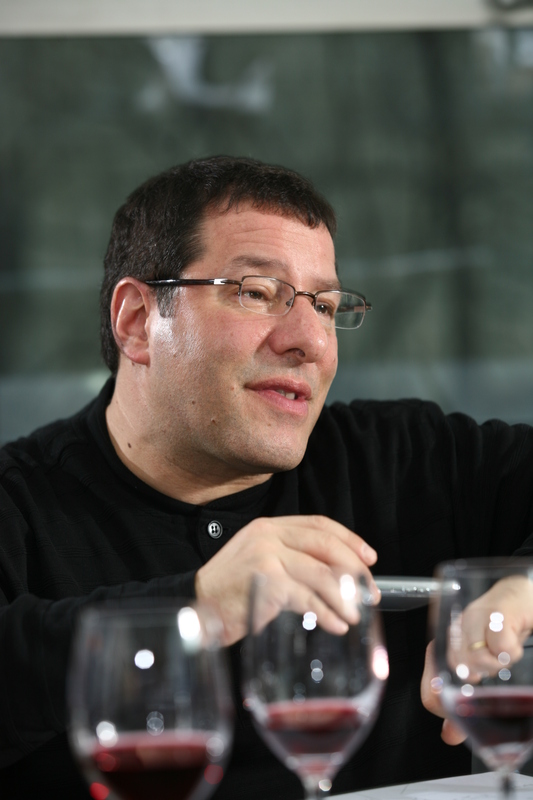 Evan Goldstein: I had the luxury of having grown up in a household where wine was part of our culture. Back in the sixties and seventies this was certainly not necessarily the case across the United States and probably less so across California than it would have been in a metro area like New York at the time, with its closer proximity to Europe. We always enjoyed wine at table. When I was young and as in European tradition I had my water colored if you will. It was obvious to my parents that I showed an actual interest and I guess I was able to keep my grades up. So, it was not unusual as teenagers that we were allowed to have a glass of wine with dinner. I had one of those great Aha moments as a teenager when we had a particularly spectacular bottle at one of the holidays. From that moment on I knew that wine was an interesting thing for me and was part of my life. I thought I was going to be a chef. That was what my training, you know, when I ultimately decided to get out of being a poor, starving, rock-and-roll drummer and do something that actually paid the bills. As I headed off to school at the University of Denver I had decided that hotel/restaurant management was going to be my way of moving forward. I took a few classes there and I got extraordinarily frustrated. I dropped out for a while, moved over to Europe and through some friends of friends found myself in a cooking school in Paris. I was almost a whopping nineteen-years old which back then was fairly unusual. I think we counted that there were three of we Americans who were not students or tourists, but actual apprentices along the lines of the Japanese and French who were apprenticing too. I thought I was going to be into food. The first restaurant I worked at was called Le Saintongeais (which is now closed unfortunately). It specialized in food from the Charentes region outside of Bordeaux. I was there close to a year and really enjoyed that initial experience. It was a small kitchen where everyone did everything and it was really great to get that hands-on training. I went on to the Hotel Lancaster off the Champs-Elysées for a while and sort of found that between the traditional French, hierarchical, culinary (regimen) as it was back then and the fact that as a hotel they had two dining rooms, room service, catering – they simply could not put the quality into the food at the level that I had become accustomed to. I realized that hotels were not going to be it but that food was still interesting to me and I came back and finished up my stage at the old restaurant that I had been at. I was planning on staying for a while when I got the opportunity to be a sous-chef at the Auberge de Soleil in Napa and moved home for that in the late seventies. After several months, I found myself back at Chez Panisse where I had spent some time between leaving the University of Denver and moving to Europe. The sub-plot if you will, is that being in situations where I was constantly exposed to wine (albeit in a kitchen situation) continued to further my interest in the subject matter. When I wasn’t in the kitchen, I tried to expose myself more and more to wine. Fast-forward past a three-month leave of absence that I took down to South America. I came home having had a realization during that trip that if I didn’t want to be known as a chef for the rest of my life, most notably my mother’s (Joyce Goldstein) kid – my mom obviously has got a bit of a name (chuckles) – that I should probably do something different. It kind of hit me that maybe wine was that animal. My mom and I gave Alice Waters (of Chez Panisse) ample notice to open Square One. I was excited about this but wanted to take the opportunity to do wine rather than cook full time. My mom was in agreement because one, between the two of us I’m the more talkative; two, you couldn’t have two Goldsteins in the kitchen and three somebody needed to be out there working the guests who was family, so it worked out quite well. That was, if you will, my first wine job. Ultimately, when we opened up Square One in May of 1984 and from day one I was running the wine program. For me, this was obviously more than just opening the doors with a wine program. The prior sixteen to eighteen months, once we had left Chez Panisse, involved understanding how it all worked, who your suppliers were, etc. We decided that since the restaurant itself was going to be Mediterranean in the greater sense of the word Mediterranean and involve not just France, parts of Spain and Italy but also Turkey, North Africa, Israel and Greece and everything like that, we wanted wines that would be reflective of the style of food. We started to show a much more international array of wines, which back then basically meant Europe. I was particularly enamored of the emergence of what we now consider to be the birth of modern, California wines. Back then, wine lists were dominated by the holy trinity of Chateauneuf-du-pape, Pouilly-Fuissé and Vouvray, possibly some classified Bordeaux and a Piesporter here and there. If there was a California wine on the list it was probably Bob red, Bob white – early Mondavi stuff and a smattering of others – maybe a Ridge or a Phelps wine if you were lucky to find them. Certainly restaurants weren’t carrying things like Stony Hill or Joseph Swan, Rafanelli or Diamond Creek and all of the boutiques (wineries) that had emerged, none of which were selling to restaurants at that point. We made the decision that we were going to do that. We opened up the doors with all of those wines that I had mentioned on our wine list, which was kind of cool! STTG: In 1987 you became the youngest individual at the time to achieve the title of Master Sommelier. What was your motivation to pursue this milestone at that early stage of your emerging wine career? EG: The first time I had ever heard about it (the Master Sommelier program, sic) was when I was invited to a tasting at Suzanne Chambers mom and dad’s house in the Upper Haight. Unbeknownst to me there were only two people invited to the tasting – myself and Fred Dame who had literally come back from London two weeks prior having passed his MS. The tasting, that was ostensibly going to be a horizontal and semi-vertical of wines from Jean-Jacques Moreau from Chablis ended up becoming more of a discussion of what the MS was all about and how it worked. We tasted all the fabulous Grand Cru and Premier Cru wines while peppering Fred with questions. Several months went by. Either Fred or Ron Weigand – I don’t recall which – contacted me to say that they were bringing the MS program to the US. “We’re going to be holding it during the Monterey Wine Festival in the winter of 1987. You’ve been selected as one of the more qualified candidates. Would you like to come in and take the program?” I did some research, made some phone calls and thought it would be a good challenge. You either pass it or you don’t. It was a great test to see if you could do it. I signed up and we went down there with about twenty or thirty of my peers. I tip my hat to the American team who put that initial group together since about a third of that class went on to become Master Sommeliers – quite a coup in and of itself! We came in, took the advanced course – four out of thirty passed – and those four were invited to come back the next day to take the MS exam because the crew had to go back to England. This was crazy when you know that nowadays you mandate a year between the advanced and the masters given the difficulty. One of the four, Madeline Triffon passed the whole thing. Three of us, myself Nunzio (Alioto, sic) and Fran Kysela passed two of the three sections. In October of that year, Nunzio and I went to the UK and passed the third section at that time. The motivation for it was not the glamour or press. In the mid-to-late 1980’s Square One and myself were fortunate to be getting a lot of nice press already. It was really a great challenge and I was interested in wine so decided to give it a go. STTG: You subsequently served for two years as chairman of the American Chapter of the Court of Master Sommeliers. Can you speak a little bit about the organization, its mission and what this role involved? EG: If you had asked all of us – the early ones – the first ten to twenty people who passed, what the history of the program and its legacy would be, I don’t think anyone would look at you with a straight face and say that it would take on the sort of sterling brand image that it has today, with now close to 140 people having achieved the MS and god knows how many people in the pipeline. In the early days your responsibilities were frankly recruitment. It was hard to get people to spend money to take these courses so you would have to recruit your friends to make sure that the classes got filled. We ran at a loss for many years. We were fortunate enough to have the National Restaurant Association as our beneficiary while we were getting our feet wet but it was really very much a grassroots organization. We put together a board, were on the board, started electing officers, etc. We were far from the successful and resourced organization at all levels that we are today.